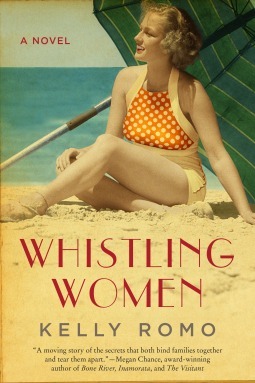 “Whistling Women” by Kelly Romo | Lit.Wit.Wine & Dine. Thanks to Lake Union Publishing via NetGalley for providing me with a free copy of this book in exchange for an honest review. Whistling Women is the story of sisters Wavey and Addie, and how their lives are torn apart and finally reconciled after too many years estranged. The majority of the story takes places during the 1935 World’s Fair in San Diego, CA. Wavey has, with limited success, moved on with her life and has been raising her two daughters in San Diego for many years since the sisters have separated. Addie has been living in at The Sleepy Valley Nudist Colony, north of San Francisco for 15 years when she learns she must travel to San Diego to become part of the nudist exhibition at the Fair. There their lives become entwined once again, largely due to the determination of Rumor, one of Wavey’s teenage daughters, to reunite them. While I was expecting this book to be more typical historical fiction, I found that it read more like chic-lit than historical or literary fiction. I was hoping to learn more about nudist colonies in the 1930’s, 1930’s San Diego, etc., but there was no real focus on those areas making me wonder how much research had been done in writing this book. The story itself was quite predicable. Very early in the book, Addie is outed as a murderer, and within about a page of a certain character being introduced, it is readily apparent who will come to be her “victim”. The characters were also difficult for me to like/relate to. Addie wasn’t as strong a woman as I’d hoped. Wavey was unlikable on a number of levels. Mary was too wishy-washy. Rumor, the most likable, was bratty and self-centered. That I could understand as being part of the “troubled teen” package, but I lost all respect for her when she had the opportunity to be a strong young lady and “do the right thing” but chose to protect an evil person. Some parts of the story lacked resolution all together, and other resolutions left me feeling frustrated or unsatisfied.